A fascinating and varied set of documents, the Léon Lipschutz collection of Dreyfusiana and French Judaica is a font of information for those interested in French history and Judaic studies. While the majority of the collection is made up of materials specifically related to the Dreyfus Affair—an explosive, all-encompassing, and monumental episode in French and Jewish history—there is also a small but notable group of documents that focus more generally on Jewish life and intellectualism in France from the late 1700s to the mid-twentieth century. Several items in this collection, while generally classifiable under the headings of Dreyfusiana and French Judaica, will be of import as well to students of literature, biblical studies , numismatics, and modern politics. One item in the collection dates from the French Revolutionary period: a letter written by revolutionary leader Christophe Saliceti to his colleague Garrau. In the letter—dated according to the Republican calendar—Saliceti champions the cause of a Jewish woman. The guide to the collection, written by Léon Lipschutz, is key to understanding its contents. Mr. Lipschutz spent much of his life in Paris studying and collecting Dreyfusiana and Judaica and donating his acquisitions to various institutions. In his guide he does not merely list the items in the collection but organizes and analyses them, providing cogent information and insight that will be useful to both the lay reader and the expert. This erudite documentation is more than a mere index; it is a source of critical scholarship. 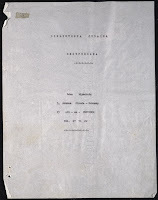 The Léon Lipschutz collection is composed primarily of Dreyfusiana. In general, the material can be divided into four series: books, letters/manuscripts, newspaper clippings, and photographs. Ranging in date from the initial days of the Affair in 1894 to well into the twentieth century, the material follows the way the Affair and its aftermath continued to play out in France and abroad, long after many of the major players had died. The Dreyfus Affair is a matter so complex and vital to recent French history, politics, and culture that it has been the subject of innumerable plays, movies, newspaper reports, essays, and scholarly texts. The event may be summarized as follows: In 1894 a young and successful Alsatian Jewish captain in the French military named Alfred Dreyfus was accused of sharing Fr ench military secrets with the Germans. This accusation was based on flimsy evidence backed up by a military establishment terrified of looking weak in the face of treason. The main piece of evidence was the “bordereau”—a ripped-up piece of paper offering information on French artillery developments, found by a French spy in the German embassy. By dint of poor handwriting analysis, this list was erroneously attributed to Dreyfus. Additional evidence was either trumped up or fabricated entirely. In short order Dreyfus was convicted and sentenced to Devil’s Island by a military tribunal. France, terrified from its recent defeat at the hands of the Germans in the Franco-Prussian War, imploded in fury over this ostensible act of treason and quickly divided into pro- and anti-Dreyfus camps. 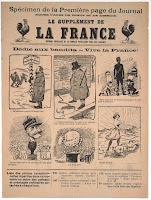 While many aspects of French culture at the turn of the twentieth century laid the groundwork for the national debacle that was to become the Dreyfus Affair, a widespread anti-Semitism was a major factor. While Dreyfus’s professional success and his wealthy Alsatian background made him an easy scapegoat and target of hatred, it was the fact of his being a Jew that was the most damning piece of evidence of all. The Lipschutz collection includes several postcards and cartoons from the Dreyfus Affair that are blatantly anti-Semitic. 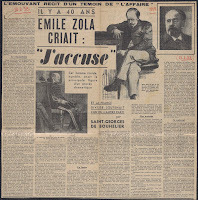 Émile Zola, the famous author and ardent supporter of Dreyfus, wrote “J’accuse!” a scathing open letter to the French president, which, with the help of Georges Clemenceau, was published on the front page of a major newspaper. 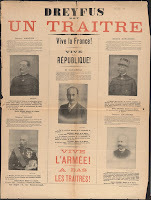 The letter virulently attacked members of the government and military leadership, implicating them in a massive conspiracy against Dreyfus. 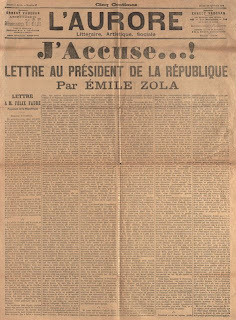 Zola’s hope, which came to fruition, was that this letter would bring to light previously hushed-up details of Dreyfus’s case and force a retrial. One of the ways in which the French military attempted to protect itself was to declare a law of amnesty, making it virtually impossible to prosecute any of those who had been involved in the initial false conviction, forgery of documents, and cover-up. Clemenceau wrote a forceful argument against this law of amnesty (the Lipschutz collection contains the handwritten manuscript draft of this piece by Clemenceau). Zola was not the only member of the French intelligentsia to become involved in the Affair. In fact, with some notable exceptions, the majority of the intellectual elite in France was in the Dreyfusard camp. 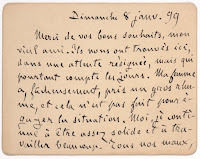 The Lipschutz collection contains a handwritten draft of L’Anneau d’améthyste by Anatole France, famed French author and winner of the 1921 Nobel Prize in Literature. While this novel does not touch upon the Affair, two other of his works do (Monsieur Bergeret and L’Île des Pingouins), and France himself was an ardent Dreyfusard who signed Émile Zola’s “J’accuse.” To the scholar interested in this manuscript, which allows virtual access to the author’s thought process, Mr. Lipschutz has given as well his own informed analysis of the draft and the way in which it relates both to the final published novel and to other discussions of France’s work. This is but one small portion of the Lipschutz collection, which will be useful to scholars in a myriad of disciplines. The entire collection has been digitized and will ultimately be available online, accompanied by transcriptions and translations. From essays on Jewish communities around France, to personal letters to and from the Dreyfus family attorney, to studio photographs of close to one hundred people associated with the Affair, the Lipschutz collection is a treasure trove of artifacts from recent French and Jewish history. See the finding aid to the Lipschutz collection here. It is often difficult to imagine what distant events MEANT in their time and place but you have conveyed well how this one act of injustice shook a nation. I am encouraged to read more about this Dreyfus character, so wrongly accused by the French. I had no idea Brandeis even offered such a collection! Way to go, Miss Seelig, with such a great piece on this hidden treasure! what a wonderful article, a gem! so informative and i am inspired to deepen my knowledge of these events through this offering.